As a parent, loving relative, or caregiver of an infant, you want to see your child flourish. Touch is one of the most important requirements for healthy development a fact supported by both ancient tradition and contemporary research. Massage is attentive, pleasurable touch that can promote your baby’s well-being while increasing your ability to respond to his or her needs. The special touch of massage is remarkable in its ability to enhance a child’s comfort. Babies who are massaged sleep better, and are calmer and more alert when awake. Massage stimulates digestion and elimination. It can also reduce the discomfort of teething and colds, and help calm fussy babies. In addition, bonding — that unique and close attachment between you and your baby — is enhanced with massage. Responding to your baby’s smiles, frowns and squirms with sensitive touch, eye contact, soothing sounds and loving communication can reinforce trust for years to come. • Children and infants who were massaged showed significantly reduced stress indicators such as heart rate and stress hormone levels. • For drug-exposed infants, massage helped increase weight gain, and relieved both tension and pain. • Infants who received extra touch developed visual attentiveness earlier than babies who didn’t. Visually impaired babies whose parents touched them early and often were able to reach toward sounds sooner than other babies. My baby was really colicky. Massage definitely helped calm her down and relieve her gas. teaches you about your baby’s unique signals, while helping him or her cope with physical stresses or disabilities. of illness. It can also help ease the pain of tension headaches and muscle aches or cramps. Children diagnosed with attention deficit disorder or hyperactivity who receive massage often concentrate better, cry less, and sleep better. Over time, receiving massage can help a child create a more positive body image and enhance emotional security. Giving massage can build your confidence in caring for your baby. You may feel more satisfied with the quality of time you spend with your infant and with your increased ability to help your child relax in times of stress. You may even find your own tension eased as you perform the gentle movements. 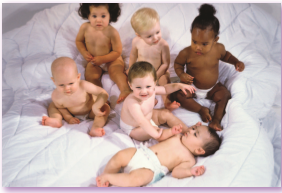 Group or private classes in infant massage are an excellent way to deepen your relationship with your child. Your Certified Infant Massage Teacher (CIMT) will be happy to explain her or his training, experience and class content. Your instructor can offer individualized help with your fussy, colicky, or special needs baby and is also a Certified Pediatric Massage Therapist (CPMT) providing massage for children with special health care needs, children who are hospitalized or have been diagnosed with a terminal illness in hospice care. loving communication between you and your child, and provide an opportunity for you and your baby to develop relaxation skills that can last a lifetime.